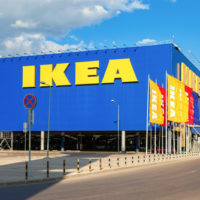 In a massive-scale recall of one of the Swedish furniture maker’s most popular furniture items, IKEA has issued a recall notice for 36 million dressers due to a risk that the dressers could tip over and cause serious injuries. So far, Ikea reports that six children have been killed by the dressers throughout the United States and Canada. The recall was issued for six different models from their line of MALM chests and dressers, manufactured between 2002 and 2016, plus around 100 additional lines of chests and dressers. According to the U.S. Consumer Product Safety Commission (CPSC), the chests and dressers all carry a grave threat of toppling onto children when not securely anchored to the wall. The chairman of the CPSC, Elliott Kaye, stated, “It is simply too dangerous to have the recalled furniture in your home unanchored, especially if you have young children.” Kaye also noted that one child is killed every two weeks by a television or piece of furniture that tips over. Between 1989 and 2007, IKEA received reports that 41 chests not from the MALM line had tipped over, resulting in the deaths of three children and injuries to 19 others. In 2014, two toddlers were killed in two different incidents involving MALM chests tipping onto the children, and another toddler was killed last year by a tipping MALM dresser. IKEA earlier offered a repair program that included a free kit to anchor chests and dressers to the wall, but they are now issuing a recall. According to IKEA, the chests and dressers are safe when properly anchored. None of the chests involved in the fatal accidents were anchored to the wall. Manufacturers who design or sell dangerous products are subject to liability for injuries caused by that product. Corporations may negligently fail to subject their products to sufficient testing to determine whether the product poses a risk of injury to consumers, or they may fail to include necessary tools or restraints (such as wall anchors) that would alleviate any safety risks posed by the product. If a product cannot be made safe, then the manufacturer has a duty to warn the consumer of any risk of injury that the product poses. In fact, if a consumer is injured by the product after using it correctly, and the product is found to have been dangerous, it doesn’t matter whether or not the manufacturers or sellers were aware of the dangers when it was sold; they’re still responsible for the victim’s medical expenses, lost wages, and pain and suffering. If you or a loved one have been injured by a dangerous product in New York, contact the knowledgeable and compassionate Hudson Valley personal injury lawyers at Rusk, Wadlin, Heppner & Martuscello for a consultation on your case, in Kingston at 845-331-4100, or in Marlboro at 845-236-4411.